The Best Time to Visit Chiang Mai, Thailand: Anytime! !The city of Chiang Mai is often known as a backpackers delight. There’s countless hostels, bars with drink specials, hipster coffee houses and cheap street food. If you’re over 20 years old, you might feel inclined to skip the mountain city. People think the best time to visit Chiang Mai is for an exotic spring break, or when wandering the globe for a gap year. But, it would be a shame to miss out after the backpacking days are over! Chiang Mai is perfect for everyone. There’s some wonderful high-end restaurants, chic hotels and incredible culture to entice those with a taste for something a little more luxurious. The Bangkok to Chiang Mai flight is an easy one-hour journey too. It’s ideal for a 3-day stopover before heading south to Thailand’s beaches. There are wild elephant populations in central Thailand – about 3,000. Many more are in captivity in the north and south, but not for reasons you’d imagine. Some are injured and unable to care for themselves. Others have been rescued from places where they were forced to haul logs or perform in circuses. When these elephants have babies, they often continue to grow up with their parents. Like people, they can’t leave mama’s side for a few years and by then, releasing into the wild isn’t possible. Like many, I wanted to make sure my encounter with elephants was as ethical as possible. I had observed them from afar in Sri Lanka before, as those specific pachyderms were going to be let free eventually. But due to various reasons, some will have to be taken care of their whole lives by people, so it’s cool to interact up close. 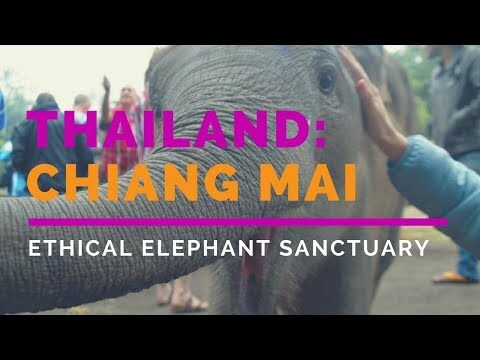 We stumbled on the “Ethical Elephant Sanctuary”, about a 90-minute drive outside the city of Chiang Mai. Just a small clan of Hill Tribe people take care of a small pack of elephants on their mountain land. A paddock area is cleared without any fences, and on the other side of a small mussy river are rice paddies and raised homes made of bamboo. Who knows what to expect when you’re a few feet away from a 6,000-pound mama elephant!? We signed up for the day with little expectation. But it was something really special every minute at the sanctuary. There was a quick overview of the Karen Hill Tribe mentality of caring for these animals. We were given traditional shirts that help elephants feel calm, as they smell like the handlers. From there, we were led over to the gentle giants. Sugar cane is a favorite treat, eaten by the bucketloads. We stood behind some bamboo rails while we got used to their presence, and vice versa. There are two moms, a grandmom, and two 18-month old baby elephants! After an hour, the little ones (not really little, 300 pounds or so!) would come up and lean on your while happily munching sugar cane. Our small group fed the elephants for a couple of hours, had a quick trek through the jungle with the animals, then broke for lunch of homemade curry. After eating, the brave ones stripped down to bathing suits (it was pretty darn cold!) and dunked in the muddy water with the gentle giants. The Ethical Elephant Sanctuary took care of everything, from round-trip transport from the hotel, lunch, elephant food and a lesson on animal care. The cost of the day was well worth the investment, as all of the proceeds goes toward the expensive care of the elephants – they eat a shedload of food every day! Hanging around with elephants all day is not often a clean activity. We returned from the experience exhausted, happy and covered in a bit of mud. Luckily, the oasis of 137 Pillars was there to welcome us into an ambiance of class, calm and relaxation after a long day. This hotel is just outside the old town and easy to get to from the airport after your Bangkok to Chiang Mai flight. Waiting inside is a beautiful reception area covered in dark teak wood, which reoccurs as a theme throughout the property. The 100-year-old main house was saved and reconstructed to inspire the rest of the hotel room bungalows. You can retire to your spacious room for a hot bath, or grab some reading time on the chaise lounge on the balcony, surrounded by tropical trees. I also loved the details of an outdoor shower – which was so welcomed in the humid temperatures to cool off while still surrounded by nature. We rinsed from the elephant sanctuary, had a dip in a lush pool, then gussied up for the evening for a cocktail at happy hour in the Jack Bain’s Bar. You can find the lounge, breakfast and dinner arrangements in the main house, offering both western and Thai cuisine. Each guest who arrives at 137 Pillars gets special treatment – complete with butler service. But this is a high-tech butler, who’s happy to offer his cell number so you can text him anytime if something is needed. He was so helpful to arrange a decadent Thai massage on-site the next day, as well as call a tuk-tuk to take us downtown any time we’d like. If you’re looking for an elevated experience during the best time to visit Chiang Mai, look no further than this indulgent property. Most Thai cities can brag about their respective night markets. People flock to these gatherings after dark, as vendors from all over offer the best street food, souvenirs, apparel and artwork from hundreds of stalls. Visitors to Chiang Mai especially love the market for its bright colors, music and wallet-friendly prices. Don’t buy the first nice thing you see. Many stalls over the same types of items and you might find something deeper into the market cheaper. You can negotiate a little if you want to buy a few things in bulk (like magnets or coin purses with elephants on them). But even better, there are a few local talented artists offering unique goods you won’t find anywhere else. Keep an eye out for people running stalls who actually create the things they sell. For instance, we picked up a few beautiful screen-printed t-shirts and a hand-painted canvas of a monk and temple. Both were down side alleys you wouldn’t have noticed otherwise, and we were able to chat with the creators. There is food intermittently throughout the souvenir stands. You can pick up savory pancakes, chicken on a stick and sticky mango rice. However, keep an eye out for the designated area of just food vendors – it’s much better. The first few stalls are all fresh you-pick-what-you-want seafood if that’s your jam. There was a DJ playing and some beer available there as well. Deep in the epicenter of the markets is Wat Sri Suphan. The day we were there at the temple it was a kind of open house, welcoming visitors (who were dressed appropriately) to explore the grounds. To the left is a totally silver temple that stands out glimmering against the night sky – it should not be missed. While the temple of silver is a sight to see, it’s well worth venturing outside the city again to check out one of Chiang Mai’s most famous holy spaces. It’s a 30-minute drive or so back into the mountains, which lead to the temple grounds. But it’s not easy, as you’ll have to climb 306 steps to reach the main gate. Feel free to peruse more vendor stalls and food before making your way up the ornate stairs. A word on temples: Make sure again you have the correct clothing. Both men and women should have their shoulders covered and either a skirt or pants that reach the ground. Many temples will have guards checking the dress code at the entrance. You also must remove your shoes at the door. It’s good etiquette to not turn your back on any Buddha statues. You should not have your photo taken facing away from Buddha either. If you’re feeling particularly rebellious, you can take the local transportation back down the hill! While an Uber or taxi will also deliver you back to your hotel, there are dozens of bright red trucks that are happy to bring you downtown again for 150 baht. It’s not glamorous! But it’s a thrill to watch the jungle whiz by from the open air of the back of the truck (hold on, there’s only bench seats). The best time to visit Chiang Mai really is year-round. But do keep in mind, it can be fairly cold up in the misty mountains. During the winter months, a jacket was needed for dining outside and exploring. But it’s a welcome break from the sweltering sun in the south and offers a little adventure to your Thailand trip! Have you interacted with wildlife in your travels? Where was your favorite hotel stay? As I sit here reading these words from beside the forest in Chiang Mai – we’re house sitting with Doi Suthep National Park as our backyard – I nod in agreement. About 5 minutes from the temple. We love town but dig staying in sleepy Pong Noi village about 10 minutes from the Gate, on the West side of Chiang Mai. Good deal on the elephant haven. More do it the right way, treating the animals with loving kindness, as it should be. Awesome post Eileen. Ryan, beautiful comment! So incredible you get to live there. I felt such an amazing energy in and around Chiang Mai – I bet village life is relaxing! Hope to return someday. Wow! Your photos are beautiful. This looks like it was a really cool trip to take. Going on my bucket list for sure! Thanks Lisa! Was tough to take photos with all the misty mountain air, haha!